On our plane ride into Heathrow, Katie sat next to a small, unassuming lady in her late seventies. As they did a little talking, it turned out that she was Alanis Obomsawin, a well-regarded aboriginal American filmmaker from Canada (neither of us had heard of her, but I probably should have) on her way to London to introduce one of her documentaries at the British Museum. On our final day in London, we made an effort to visit the museum and check out the film. It surpassed my every expectation. “Kanehsatake: 270 Years of Resistance” covers the Oka Crisis, a confrontation between Mohawk Indians living on a reserve near Oka (not far from Montreal) and the Canadian military. A local land development interest gained government approval to expand a 9-hole members-only golf course onto a burial ground and sacred pine grove belonging to the Mohawk nation, reigniting a 270 year battle to officially regain their territory. The Mohawks blocked incoming construction equipment and Quebec Security was called in. After shots were exchanged, a police emergency response team bungled the situation, firing tear gas that the wind swept back into their own position, forcing a retreat. 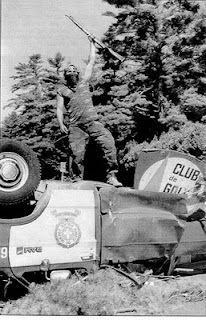 In the chaos, the Mohawks seized an abandoned bulldozer and used it to crush police cars and push them into a barricade. Other Canadian first nations pledged support and the nearby Kahnawake reserve captured a major highway bridge. The Royal Canadian Mounted Police and eventually the Canadian military took over, leading to a 78-day high-tension standoff. Alanis Obomsawin arrived early in the debacle and was one of the few filmmakers or journalists to evade the military-enforced media blackout, chronicling the incident from within the heavily-patrolled, razor-wire perimeter. While Obomsawin covers the history and context behind the incident, the power of her documentary comes from her extensive firsthand footage. Obomsawin rarely appears in front of the camera and her interview style is minimalist and encouraging, allowing her subjects to open up and express themselves. Although the scarcity of leading questions might have threatened to make the film lose focus, the editing keeps things tight and smartly relevant. Her unobtrusive use of irony and humor points out the absurdity and hypocrisy of the Canadian government’s reaction (like running razor-wire underwater) without trivializing the complexity of the situation and the emotions involves. One of the most thought-provoking aspects of the film is the way it captures the clash between colorful individuals standing up for their modest rights and large institutions, especially the Canadian military. The individual soldiers hide behind the usual unthinking platitudes like “I’m just obeying orders” and “I have a mission to accomplish” instead of relying on their own moral compasses. The result is that their behaviors are akin to mental illness symptoms, including denying verifiable facts, showing indifference towards the suffering in front of them and adopting self-induced stone-faced autism as a way of avoiding questions, confrontations and emotional involvement. The military is seen using fear and intimidation tactics, suppressing press coverage and frequently breaking promises. And yet hardly any soldier openly expresses dissatisfaction with their vocation or the institute they serve, and certainly none try to redress the wrongs. While this isn’t surprisingly to anyone familiar with military psychology or history, it’s disturbing to see it occur in modern society and within the armed forces of well-regarded democratic country. One has to wonder whether the military can be too effective, especially when it removes the ability for self-analysis and self-correction through the use of individual consciences and becomes merely a tool in the hands of political and commercial powers. But I’m getting into the dangerous territory of mixing my own interpretation with the film’s less-pointed, less-systematic approach. In truth, while the directing and editing take a very sympathetic viewpoint, the film is not overly wrapped up in a private agenda and truly seems committed to honesty. Obomsawin covers the death of a police officer by the Mohawks and shows occasionally unflattering footage of individual Mohawks who, at times, lack maturity, temperance or eloquence. She depicts their internal struggle with balancing self-respect with survival, the fractured opinions on how to handle the situation and the difficultly in controlling feelings of anger and vengeance. Obomsawin is of Indian heritage herself (albeit a different tribe), but her own vested interest is really much wider than purely first nation issues and concerns the larger scope of human rights for voiceless minorities everywhere. I hadn’t even heard of the Oka Crisis prior to seeing the film, but she draws us into the fate of Kanehsatake Mohawks in a way that is quick and natural despite the fact that many viewers will have little in common with the tribe. My own circumstances are much closer to the non-Mohawk suburban community of Oka, who are seen in the documentary reacting with outrage, apathy, paranoia, racism and even violence primarily over the mere inconvenience of traffic jams caused by the barricade. It’s a bit sobering to reflect on how I might have reacted had I been in their shoes. On a less serious level, the movie is action-packed and well-crafted, making for a riveting two hours that doesn’t suffer from the “talking head” and “clipart” syndromes that drag down many otherwise noble documentaries. The film isn’t susceptible to the self-indulgence and cult-of-personality accusations that plague Michael Moore and Morgan Spurlock and its sincerity is refreshing without being cloying. It’s informed, impassioned, judiciously paced and just about everything else a documentary should be. In retrospect, I wished I’d spent my plane ride interviewing Alanis Obomsawin about her work, goals and future plans rather than watching “Twilight” (2008) as an in-flight movie. Damn my social awkwardness and vulnerability for vampire drivel. I'm of a mind that not enough movies are telling the story of the issues that Native American people are having to live with on a daily basis. I listened to an NPR special on crimes at reservations (which instantly makes me an expert, of course) and was horrified at the plight of these people. I think more could be done by filmmakers to bring some of these circumstances to light, because there's definitely a whole lot of human interest for both nonfiction and fiction fodder. I would like to see her other work, if you could arrange that.